Television seemed more exciting to me when I was younger. The same goes for movies, I used to love going to see new movies every Friday evening in my twenties. I would get addicted to television shows and be excited for the next weeks episode. Now in my middle thirties television and movies just don't seem to hold the same appeal. A big part of the change might have to do with the Internet and the way that I watch movies and television. My family dropped cable years ago, we now rely on Netflix and Hulu. It's cheaper and we don't miss having all pointless channels that have nothing to watch on them. However, I also seem to not enjoy television the way that I used to. I get bored halfway through a lot of episodes and more than a couple of seasons of any show is just a little too much. There are exceptions, there are some shows that I have watched for years, but they are the exception not the norm. Maybe my expectations for television and movies have gotten higher the older I get. I have far less time to waste hours watching a movie that I hate. Maybe I just haven't watched anything great lately. Whatever the reason I have preferred books to television and movies for years and the trend seems to get only stronger the older I get. Hopefully I'm not alone. Last week I was having a strong craving for pancakes. Gluten free pancakes can be very hit or miss, some are great, others barely edible. 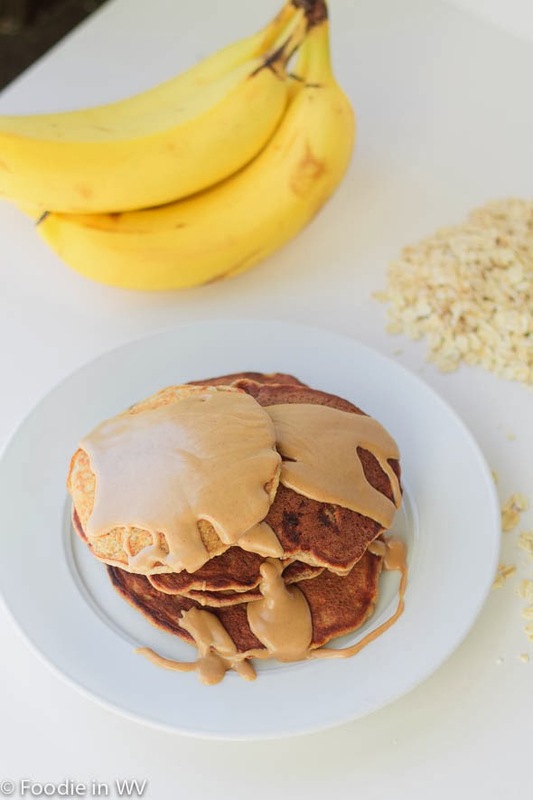 I decided to try a new recipe for Gluten Free Banana Oatmeal Pancakes in order to utilize the large amount of oat flour I had in my cupboard. This recipe has 10 ingredients. It takes 20 minutes of total time, 10 minutes of which is active, and makes 8 pancakes. I only made a few changes to the original recipe. First I had a large container of coconut oil so I used it in the recipe. I warmed it in the microwave and I had no problems with it re-solidifying (like the recipe mentioned). I also cheated and didn't let the batter sit for 10 minutes. It was breakfast and I was hungry and I just wanted to eat. Not letting the batter sit didn't seem to change the outcome of the pancakes. They were still fluffy without the wait time. Finally, I doubled the recipe and made my pancakes a little bigger than the recipe suggested so I ended up with 12 pancakes total. These pancakes turned out very well. I topped the servings with melted peanut butter (which is delicious on pancakes and waffles - just heat peanut butter in the microwave for 20 seconds and it pours like syrup). The pancakes had a great banana taste and rose well on the griddle. They were delicious with peanut butter, but would also be great with butter or syrup. The only change I would make would be to add a small amount of vanilla extract the next time. 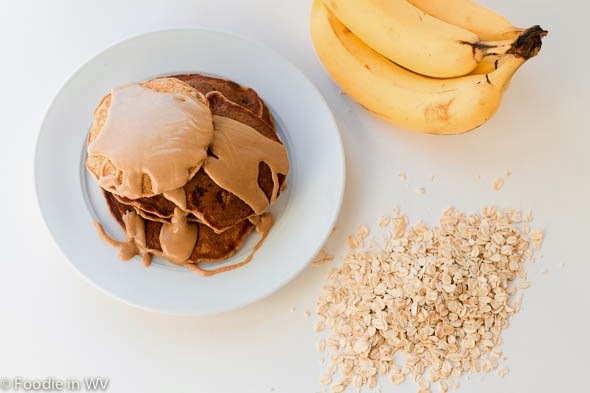 For the recipe go to Gluten Free Banana Oatmeal Pancakes. I love the idea of putting melted peanut butter on them! My husband makes banana-walnut pancakes, which are like banana bread. They'd be good with peanut butter too. They look very tempting served with melted peanut butter! 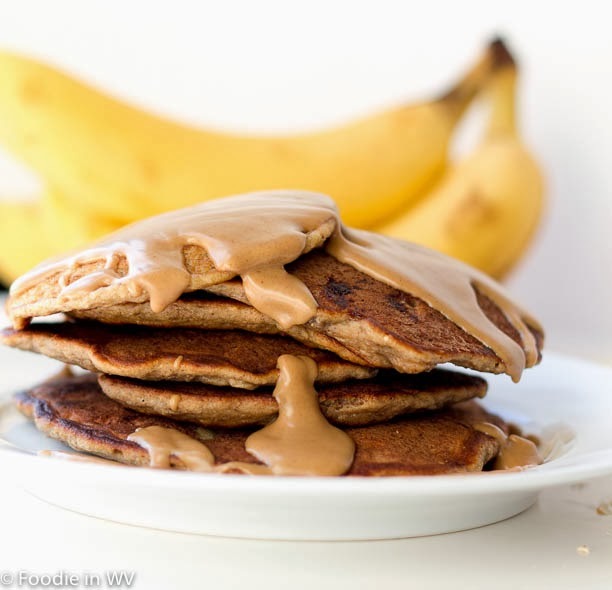 The peanut butter and banana were perfect together! They turned out really fluffy, which was nice since so many gluten free pancakes fail to rise. My kids prefer waffles, but will eat pancakes when I make them. These were nice since they don't taste gluten free (like the boxed mixes do). We still have cable, mostly for the kids. Chris and I hardly ever watch tv. We have a small handful of shows that we watch and that is it. We are the exact same way, we only watch a few shows, everything else just doesn't hold our interest. I love using melted peanut butter on pancakes and waffles, yum! They look delicious. I love pancakes. same here! i could spend hours watching tv back in the day...shows, MTV, whatever! now, we still have cable, but it's only the basics and mainly for news. i rely solely on netflix for everything else. and i find that when i actually have a chance to sit and watch TV, nothing can hold my attention!